Obama and the fashion icon first lady should pick up where the presidential task force on the apparel industry left off fifteen years ago. President Obama has been eerily silent on the Rana Plaza disaster, the factory collapse that killed more than 1,110 garment workers last month near Dhaka, Bangladesh. Days later, another fire claimed eight people, and Obama said nothing. This week, two people died in a shoe factory collapse in Cambodia. Not a word. The problems that plague the global fashion industry deeply affect the American people, from an economic and humanitarian standpoint, and this situation calls for presidential leadership. As of today, many of the largest US clothing retailers, including Walmart, Gap, J.C. Penney and Sears, have yet to sign on to a rigorous fire and safety agreement that would require brands to help fund necessary building improvements in Bangladesh. Walmart, the single largest buyer of clothing from Bangladesh, has in fact refused to sign, deciding instead to monitor its more than 200 Bangladeshi suppliers itself. The suggestion that Walmart is capable of monitoring its own supply chain is particularly appalling given that the retailer is linked to the Tazreen factory fire, which killed 112 Bangladeshi workers last November, and sold jeans from a supplier that operated in Rana Plaza. As I said in last week’s post, the president needs to force these companies’ hands and pressure them to sign on. If Obama is unsure of how to act, he might start where former President Bill Clinton left off. In 1996, Clinton established a presidential task force made up of brands, government officials and labor leaders in order to regulate the global apparel industry, following a string of sweatshop scandals. That year, a human rights group revealed that Walmart’s Kathie Lee Gifford brand was being made by children in Honduras, and public outcry built until Clinton joined forces with brands and labor leaders to forge a solution. Aside from improving factories themselves, the task force’s goal was to give American consumers a way to track the conditions under which their clothing was made. Clinton’s White House Apparel Industry Partnership spent two years establishing a baseline standard for working conditions in garment factories (it set weekly working hours at sixty, for example; and banned child labor). The Fair Labor Association, an auditing group, was set up to inspect progress in factories and make the results of its inspections public. Since the mid-1990s, many things have changed in the apparel industry and in the world, which Obama’s twenty-first-century apparel task force will have to account for. Garment supply chains have moved from Mexico and the Caribbean basin—where one could argue it’s slightly easier to monitor conditions—to places like China and Southeast Asia, where language, distance and cultural barriers make monitoring more difficult. The amount and dollar value of clothing imports to the United States has also skyrocketed since 1996. We now make only 2 percent of our clothing domestically. The sheer volume of imports makes monitoring conditions a much more difficult task. The president may fear addressing the fact that unregulated imports have not only caused human misery but have rapidly cost the United States its garment and textile industries. But this is an opportunity for real change both here and abroad: Lifting wages and conditions for garment workers worldwide would be beneficial for places like Bangladesh and would also give our country’s manufacturers a chance to compete. While the Clinton-era monitoring system was a good start, the new presidential task force should fulfill the promise to consumers to be able to trace where our clothes are from. It should require that every American brand make public all its suppliers and for all suppliers to by inspected by an independent group (and that those inspections be made public). Perhaps the results could be collated in one place, on one website, or a fair-labor labeling system could be developed to communicate which brands are responsible. We also need the leadership of our first lady, a fashion icon and a consumer of clothes from H&M, which produces in Bangladesh. She must help change the culture of fashion in the United States. The price of a chain-store frock has gone lower and lower in recent decades, and Americans have used this as an excuse to stockpile our closets with gobs of disposable trends. An unhealthy reliance on imports suppresses wages in the United States and costs us jobs. Even though cheap imported consumer goods contribute directly to our economic woes, Americans celebrate bargain fashion. 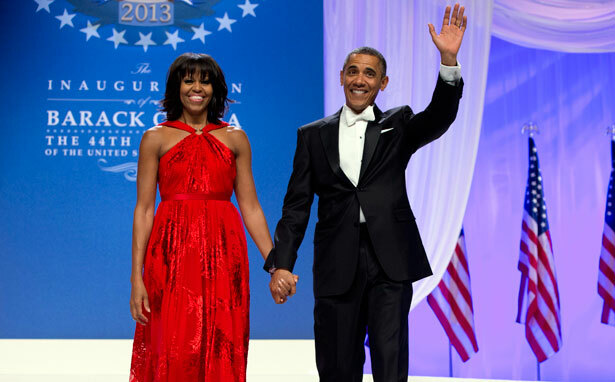 And we love it when Michelle Obama wears H&M and shops at Target. It be would be amazing to hear Michelle Obama say that fairly and affordably priced fashion should be our new goal, not simply scoring the cheapest bargain we can find. And that a clothing steal should never come at the price of life. Lastly, she and Barack should make us believe once again that when brands, garment workers, governments and consumers all work together, fashion can and will be made in safe and healthy conditions. San Francisco Giants concession workers have voted overwhelmingly to authorize a strike. Read Dave Zirin’s report.